There are some things that I never thought I would see in a movie — like Vijay and Sher Khan playing a video game. Let me explain. Vijay is Hindi cinema’s original angry young man. The item number comes in uninvited as we are served the dancer’s anatomy part-by-part. That Zanjeer was a classic. This remake is wrong on so many levels that I don’t know where to begin. 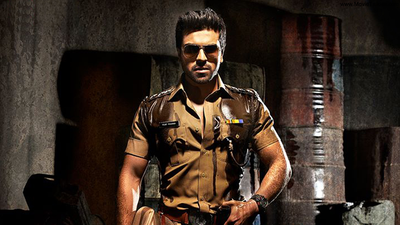 The new-age Zanjeer doesn't hold half as much promise as the cult classic did and literally falls flat on its face. Watch the old one once again and forget about this. Remaking a film of this magnitude is a tough job, because fitting into the shoes of Amitabh Bachchan and Jaya Bahaduri was never easy. An upright cop sees himself transferred innumerable times in five years. Will he succumb to the pressures of the administration or will he make his voice heard above the din? Aparna MudiIf remakes are supposed to pay homage to erstwhile super hits, ‘Zanjeer’ hasn’t done a very good job of it. Lazy attempt to surpass the original! It took Bollywood six long years to match up to RGV Kii Aag, Ladies and Gentlemen make way for Zanjeer! Final call for Zanjeer boils down to simple things. Noone could undo self inflicted shackles. And Sanjay Dutt is the savior among the slaughtered. Don't make remakes and sequels just for the sake of it and not every successful movie's formula can be replicated by anyone. Everything is distorted in Apoorva Lakhia’s Zanjeer (Shackles), a modern-day version of the iconic 1973 action-thriller of the same name that gave Amitabh Bachchan his aura of Bollywood’s angry young man. Steer clear of this movie. Ram Charan Teja is no angry young man! Btown remake trace a long way since Mehboob Khan's classic 'Mother India' (1957 starring Nargis, Sunil Dutt and Rajendra Kumar) the remake of the maker's earlier Aurat(1940 starring Sardar Akhtar and Arun - Govinda's father).. Mother India which missed the Oscars in the best foreign language category by a whisker is one of Indian cinema's most glorifying chapters..
Like its hero on screen, the film too has no reason to exist. Zanjeer is a dull show which also looks dated. Except for action, that too, mainly for the mass audience, there is not much for the viewers. As such, the film's run at the box-office will not be exciting.